While most seasoned birders are aware of Warbler Neck, newer birders and future birdwatchers may be ignorant of the pain that many suffer each spring migration period. 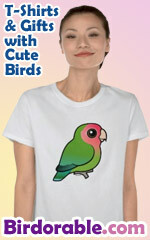 This original design includes an illustration of a birder looking up, with stress marks around the neck. 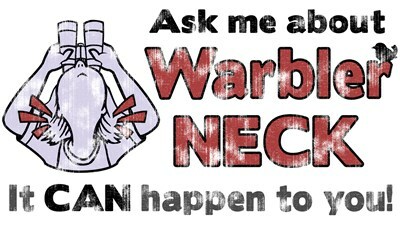 The slogan reads "Ask Me About Warbler Neck" and "It CAN happen to you!" Help educate fellow birders and non- or future birdwatchers alike with this design, which is faded for a classic, vintage look. Warbler Neck has, after all, been around for a very long time. To order by phone, call toll-free at 1-877-809-1659 from Monday - Saturday 9:00am - 9:00pm EST. You'll need to note the Product Number 030-1265579413 to make your order.